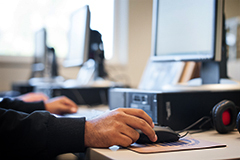 The Computer Applications and Web Technologies (CAWT) program prepares students for careers in administrative support. Many students take our courses to improve their current job skills or to learn new skills to move into a new career. All CAWT courses are offered yearly with many offered every term. Courses are offered on campus, as hybrid (on ground and online) and online. Check the term schedule to see when the courses you want are offered.